However if you look at the specs on that heater there are a couple very important details I didn't pay attention to before. First : The heater requires 120Amp electric service. Thats a lot o' power. Your typical 50 gallon tank water heater only uses around 20-30 Amps. Your home will likely be wired to provide that much power for an electric water heater. To install a tankless water heater and provide the 120A of service you may need to upgrade your electric panel. Older homes may only have 60A or 100A service so you may need to upgrade to 200A level. Upgrading an homes amperage capacity could be a $2000 bill. If your home isn't outfitted for the high amperage requirements of a tankless electric water heater then it could cost you a substantial amount of money to install the electrical service to support a tankless electric heater. Second : The amount of water you can heat at a given time depends on the temperature of the water coming into the home. They quote a 4 gallon per minute output for the heater. However that is only true if the inlet water is relatively high temperature to begin with. The 4 gallon per minute rating is assuming that you're heating the water by 45F. If you want your water to be 105F then that amount of temperature rise assumes the water starts at 60F temperature. But if you have to rise the temperature 77F then you can only get 2.4 gallons a minute. If you live in a warmer area like Hawaii, California or the US South then your water will be 55-75F when it comes into your home. In these climates you can then heat your water 45F and get it up to the 100F level. However if you live in a Northern state then your water will be 35-50F when it comes out of the ground. You'll need to heat that water a lot more to get it up to the 100F level. 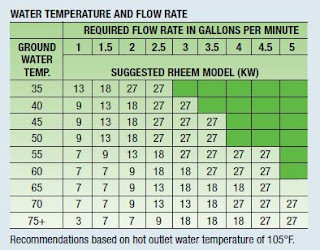 I also found a spec sheet from Rheem that shows the same effect. The graphic to the right is from the Rheem site and shows how the temperature works versus gallon output. As you can see in the graph if you live in a colder climate with 35F water then the 27 model tankless heater will only get you 2-2.5 gallons a minute. But if you live in Hawaii where the water is 75F then the tankless can put out 4.5-5 gpm. If you live in a colder climate area then a tankless electric heater may not be able to heat enough water to service a whole home. Bottom Line : Electric tankless water heaters may require costly electrical upgrades and may not be practical for homes in colder climates.